Today I returned to WVIK, one of our local NPR stations, for an interview on the show Scribble. 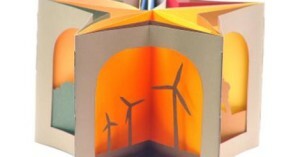 Hosts Don Wooten and Ronald Tweet talk about books, poetry, and now… the making of books. I had a fun time and think they did as well. This entry was posted in Uncategorized on May 20, 2015 by bigriverbindery. The Broadside started as an announcement or poster, a sheet of paper printed on one side. 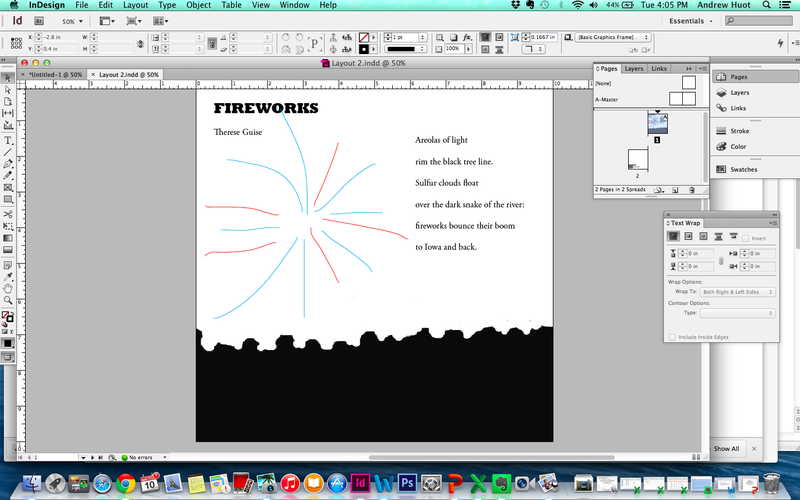 Now most broadsides are printed text (often poetry) combined with artwork. I recently was commissioned to print a broadside by the Midwest Writers Center in Davenport. 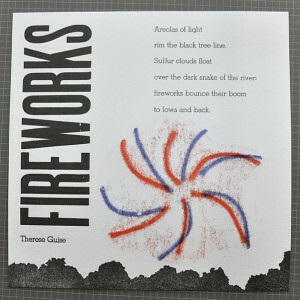 The broadsides they produce are related to poetry prizes that they award to Midwest writers. The Center gave me a wide latitude in how I produced the work. I started with some rough drafts, using a computer and and a layout program. I was going to use hand set type and hand made illustrations, but the computer lets us try things out and play with ease. 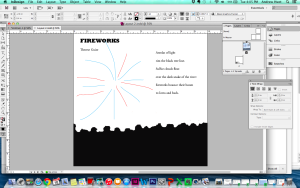 Printing out a hard copy can let you visualize the space on the page and is quicker than inking up the press. Once I had a general idea in mind, I started setting type. I chose a typeface that was fun but easy to read. I want the viewer to read the poem and not just look at the imagery. I checked the line length of the poem, and arranged the line length of the lead to match it. Composing in lead is slow, letter by letter. I enjoy setting type, it’s meditative and quiet work. You read the text time and again, and get to know it better. For the tree scape at the bottom of the print, I carved the landscape in linoleum using carving tools. 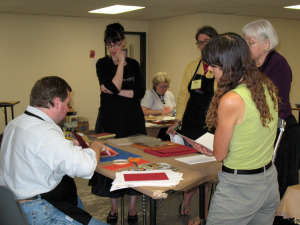 I start with a photograph or drawing, transfer the image with carbon paper, and carve away. 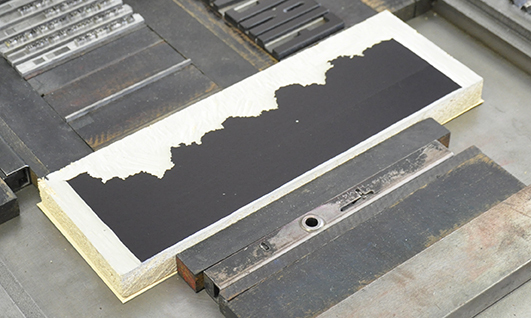 It’s important to remember to reverse the image before you carve, as the printing process reverses the carved block. The elements are laid out in the press bed, and wood blocks called furniture fill in the open spaces. Small clamps, called quoins, lock everything in place. 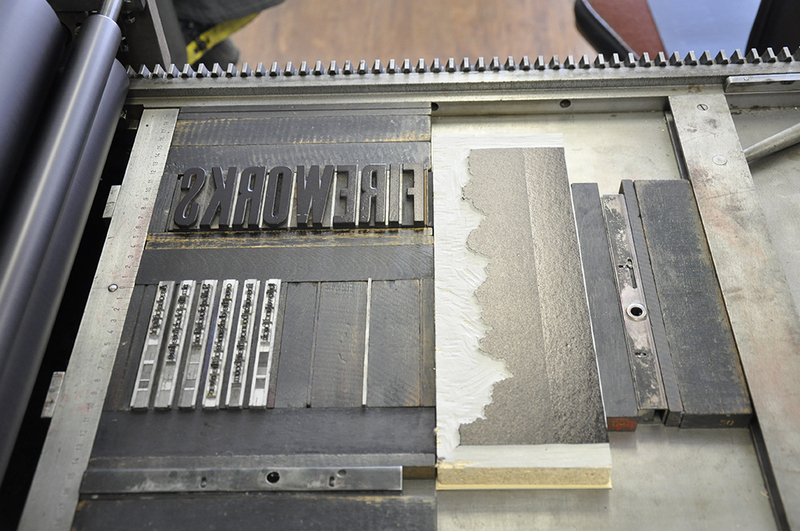 The press is inked up, test prints are made, and we go to town. 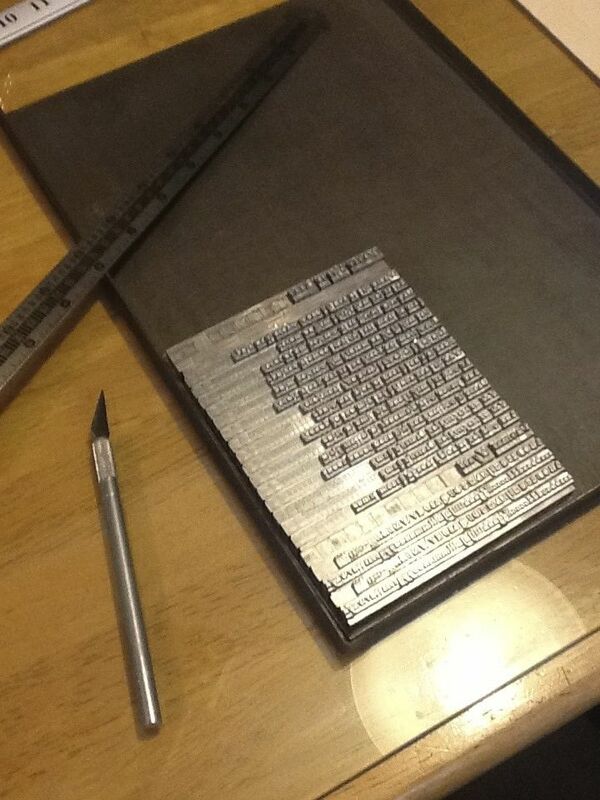 My test prints showed me that the layout was a bit tight, so I made a quick adjustment of the wood type. I also found out that the author’s name wouldn’t fit like I wanted, so I would add that as an additional run through the press. Here you can see the single line of type set in the press bed. I wanted to add some color for the fireworks, and used the pressure print process. 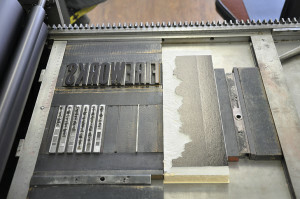 A type high block was placed in the bed of the press and inked up. 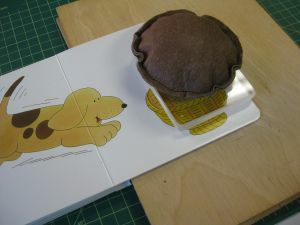 A low relief plate was made using cord and card. The high elements of the plate press more against the inked block, and create darker areas. Some adjustments in thickness of the block allow more or less of the fuzzy background image. 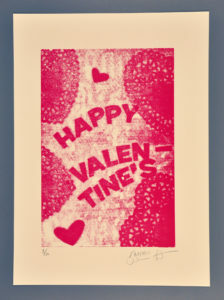 I used a cut stencil to control the color printing on the paper. A second run with a second color finishes the printing. Some time at the paper cutter trimming down and the broadside is done. You should read more of Therese Guise’s poetry (in the recently published OFF CHANNEL 5) and see about the Midwest Writers Center at http://www.mwcqc.org/. This entry was posted in Uncategorized on March 11, 2015 by bigriverbindery. 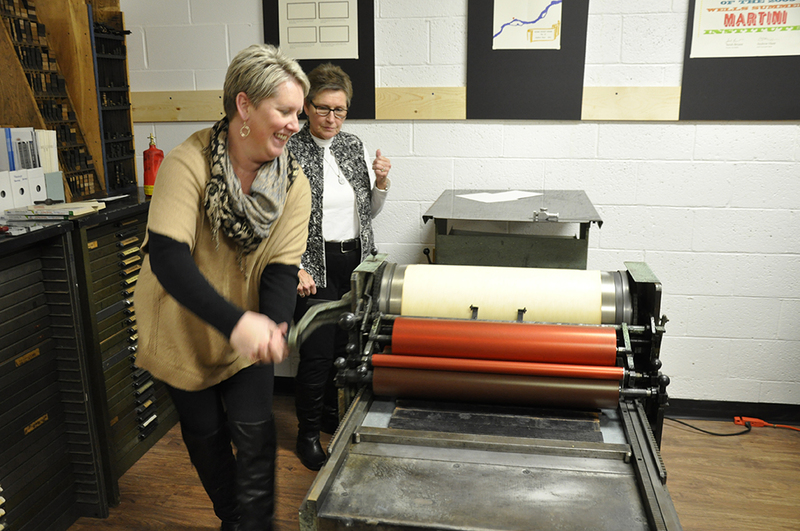 Join us for another fun evening of pints and printing in the studio. 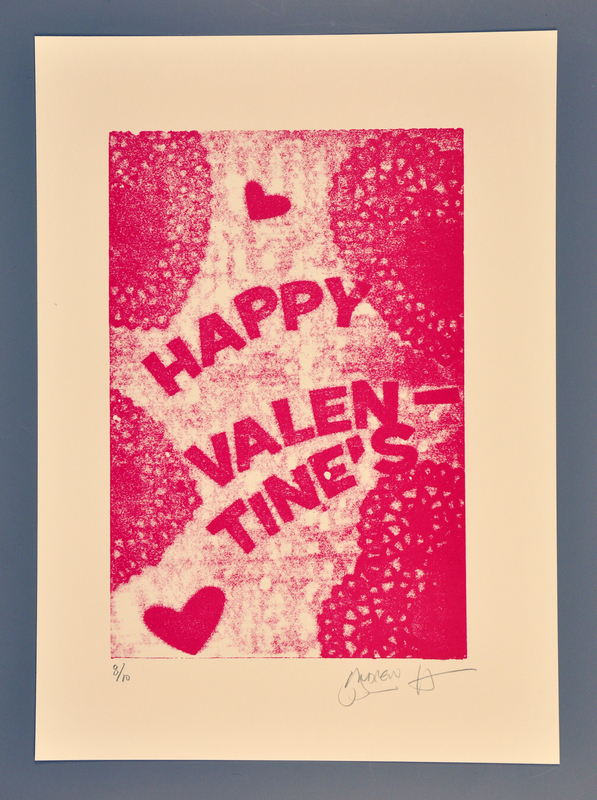 This time we’ll be making pressure prints, a method similar to rubbings. A type-high block is set in the press bed, and a handmade low-relief plate – in this case your collaged shapes and words – is inserted behind the printing paper. The higher the relief, the darker that area is. It’s a quick and simple way of making images and text. 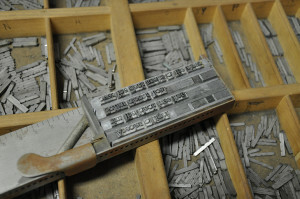 Unlike most printing, the text and imagery don’t have to be reversed. Enjoy a FREE local beer (21 and older) while you work the presses. 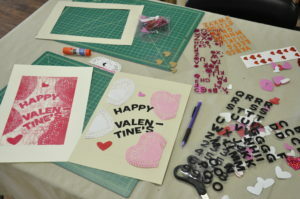 Participants will take home 4 handmade prints and bragging rights that you printed it yourself. $20 for the evening (additional prints $1 each). Register now by sending us an e-mail (bigriverbindery@gmail.com). Your registration fees can be paid on-site via cash or check. This entry was posted in Uncategorized on January 12, 2015 by bigriverbindery. I recently was asked to create an artist book as an award to community members and groups by Radish Magazine. Instead of a plaque, they commission artwork from a local artist each year. The January issue of Radish just came out, and my carrousel book is on the cover. You can see it here. 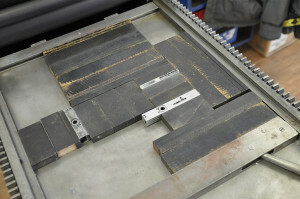 You can also see an article about the bindery and our work. This entry was posted in Uncategorized on January 11, 2015 by bigriverbindery. Join Big River Bindery for an evening of letterpress printing and holiday cheer. 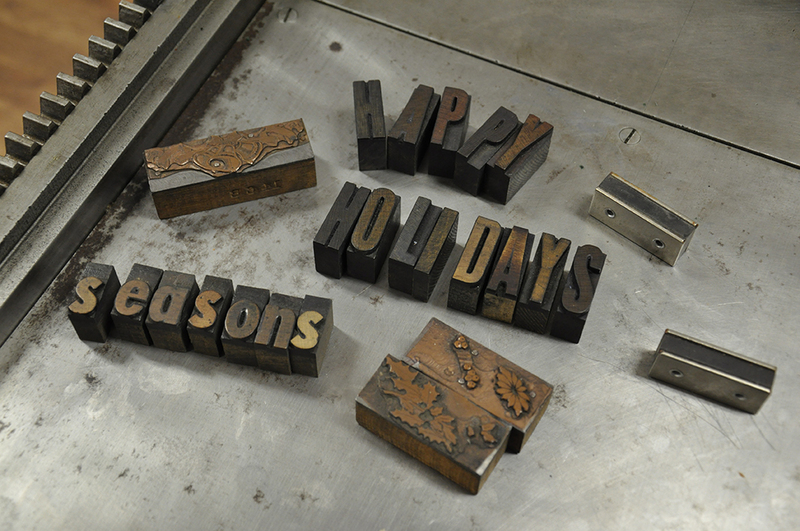 Both presses will be set up so you can print your own two-color holiday cards. Enjoy a FREE local beer (21 and older) while you work the presses. 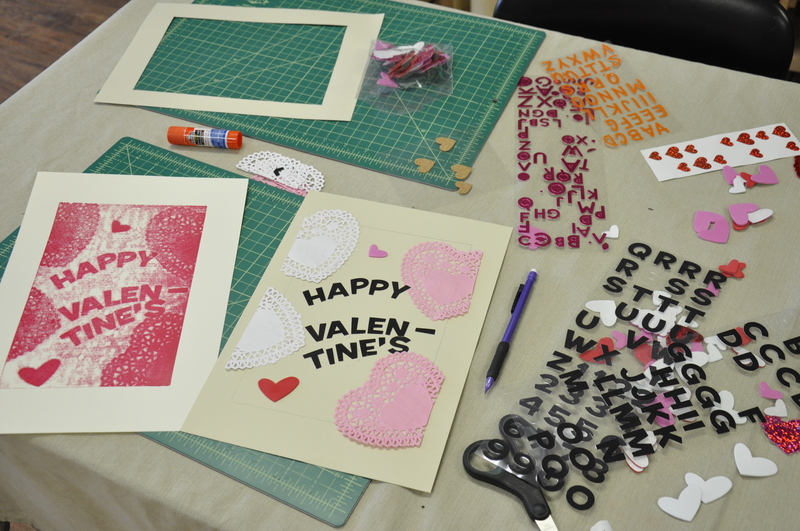 Participants will take home 5 handmade cards and bragging rights that you printed it yourself. $20 for the evening (additional cards $1 each). Register now by sending us (bigriverbindery@gmail.com) an e-mail or FB message. Your registration fees can be paid on-site via cash or check. This entry was posted in Uncategorized on November 16, 2014 by bigriverbindery. Now the the boxes are unpacked (well, most of them), and the shop is mostly set up, it’s time to get down to work. 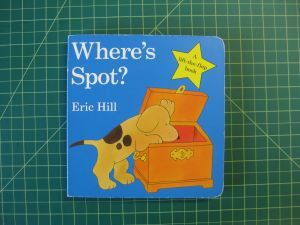 One of my first projects was a pro bono project on a children’s book, belonging to my son, Ethan. Books with flaps regularly have problems, especially when handled my small hands. You can here that one has become detached from the page beneath. We wanted to catch that right away, before we lost the flap. Since this will still be in use, an adhesive that is strong and quick to dry was used. 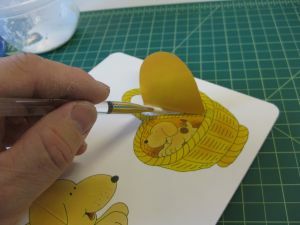 PVA (Polyvinyl alcohol) is a synthetic glue that has been tested to be safe for long term use, and is common in bookbinding and general collections conservation. Application of a thin layer with a soft brush was all it needed. 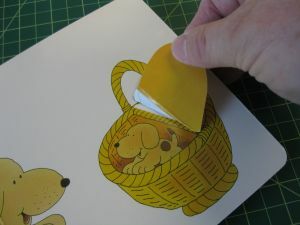 Once applied, we wanted to dry the page under pressure, to avoid warping while the repair dried. A plexiglass board and weight applied the right amount of pressure. 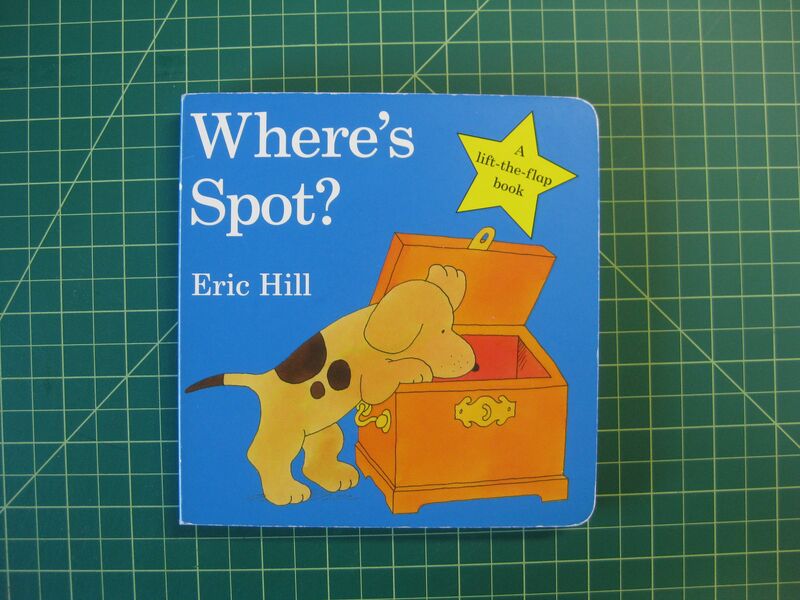 By the end of the day, the book will be back in Ethan’s hands. Not the most complex conservation treatment for the week, but I’m happy that my son won’t go shoeless (or bookless) for too long. This entry was posted in Uncategorized on October 28, 2014 by bigriverbindery. Join us for the grand opening of Big River Bindery. We’re unpacking the boxes, and putting the type away. 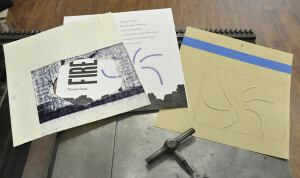 Try your hand at making a folded pamphlet book or printing on the letterpress. We’ll be showing examples of the book repair and conservation, boxes and bindings, and some of the artists’ books and prints we’ve made. This entry was posted in Uncategorized on October 16, 2014 by bigriverbindery.